The first single "Remix (I like the) will be released on January 28 on itunes and the new album called "10" will be released on April 2. 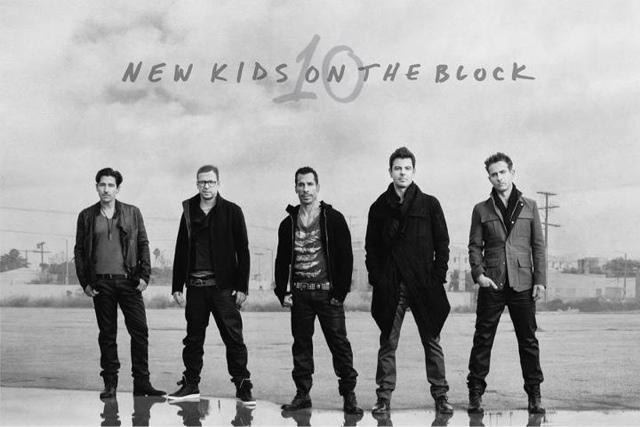 You can now listen to preview clips of NKOTB's new album "10" on Amazon! Tickets to the event will go on pre-sale to BLOCK NATION ONLY Wednesday, March 6, 2013 at 10am EST and general on-sale Saturday, March 9, 2013 at 10am EST. Good start consodering how radio snubbed "Remix (i Like The) but hopefully the 2nd single will get the radio support it needs and the tour will help the album sell steady thougout the rest of the year. I wonder how good it's expected to sell in Canada. Their last album went Gold there (40,000 units). The returning New Kids on the Block should see its tenth album, fittingly titled "10," debut in the top 10 with around 45,000. Their last studio release was 2008's "The Block," which debuted and peaked at No. 2 off a 95,000 launch. The group returned in 2011 with the collaborative greatest hits album "NKOTBSB" (with Backstreet Boys). It bowed at No. 7 with 40,000. On SoundScan's Building chart (below), Timberlake is No. 1 while the Band Perry and Tyler, the Creator are Nos. 2 and 3, respectively. The Building tally is a precursor to the final Billboard 200 ranking, reflecting the first four days (Monday through Thursday) of SoundScan's tracking week as reported by six major merchants. 1 1 Justin Timberlake "The 20/20 Experience"
2 NEW The Band Perry "Pioneer"
3 NEW Tyler, the Creator "Wolf"
4 3 Blake Shelton "Based on a True Story"
5 NEW New Kids on the Block "10"
6 2 Lil Wayne "I Am Not a Human Being II"
7 NEW Killswitch Engage "Disarm the Descent"
8 8 Imagine Dragons "Night Visions"
9 7 P!nk "The Truth About Love"
10 9 Bruno Mars "Unorthodox Jukebox"
New Kids On The Block’s 10 debuts at #6 (51K). It’s the group’s sixth top 10 album. It’s the group’s 10th album release in the U.S. (counting three compilations). It’s the group’s sixth album to reach the top 10. Only one boy band in history has had more top 10 albums. Backstreet Boys have had eight. The Jackson 5 (later known as the Jacksons) also had six. New Kids first cracked the top 10 in March 1989 with Hangin’ Tough. The group has had as many top 10 albums (three) in the last five years as it did in its late ’80s/early ’90s heyday. New Kids has been charting longer than any other act in this week’s top 20. They first charted in August 1988. Alan Jackson is in second place. He first charted in March 1990. Two members of New Kids have charted with albums of their own. Jordan Knight has charted twice; Joey McIntyre once. That's really a huge dive... It's clear that they are unlikely to sell "well" again but I didn't know that they barely appeal to anyone apart from their old fanbase anymore... Where are their casual buyers gone? To be honest, the music is pretty generic. Not bad by any means, but just normal. And if you get to pick between average and typical music sung by a group of old (for mainstream music standards) guys or that by a currently hip, hot and happening singer that gets tonnes of airplay, I think the choice is clear. Now that you say it... I think they are really the type of band, once been popular, that gets like a 5x Platinum album after a streak of flops because they are cool again... Wouldn't surprise me!